ocks are avoided by most cruising sailors. They bring to mind the hard grounding, the ruptured hull, the water pouring in on the floating dream. Not so for nine year old Marvin Echenard aboard the steel cutter, “New Life.”. He collects them. To him, rocks are “treasure,” prized objects to be sought on distant islands. The Echenard’s nine year cruise has shown how stones and boats can coexist. 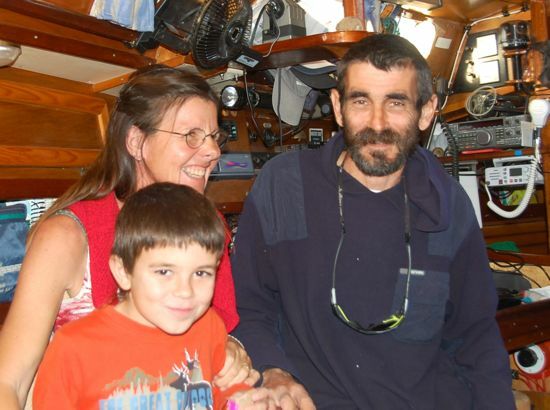 Marvin and his parents Thierry and Patricia Echenard recently visited the Town Dock aboard their steel cutter, New Life. They’d spent the summer in the Chesapeake Bay and were now heading south, to warmer weather. Originally from Le Mont-sur-Lausanne in Switzerland’s French-speaking region, they have been sailing the Caribbean and US East coast for almost a decade. The stones Marvin has gathered trace his early traveling years. While the stones in Marvin’s collection come and go – some end up back in Switzerland with his grand parents, some are given away – most are tied to a geographical memory. Take one of his earliest acquisitions. White and angular, it came from a beach in Venezuela. “I was digging in the sand and found a big rock but it was too big,” he says. So he chipped off a white piece of stone attached to the large rock. It served as the seed of his collection. Over the 9 years the family has cruised, his collection has grown to include dozens of other pieces. A flinty stone from Curacao. Pumice from a Caribbean volcano. 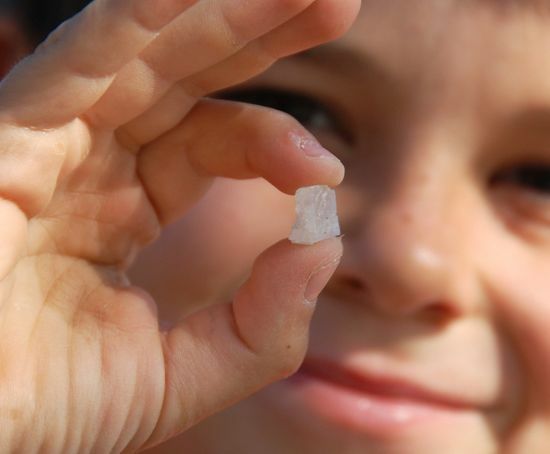 A quartz-colored chunk from Panama’s San Blas islands. There’s lapis lazuli and blue pectolite, also called larimar, acquired in Colombia and St. John in the US Virgin Islands. A piece of quartz picked up in Marvin’s Caribbean travels. Unlike the shells, carvings and textiles traditionally collected by sailors, gathering stones poses some boat-specific challenges. Mostly it’s the weight. Too many rocks on a boat cut into valuable buoyancy. So Marvin sticks with pieces the size of his fist or smaller. Many are silver dollar-size or less. Not that there’s a law on board New Life against bringing home really big pieces. Marvin says that for the right rock, that wouldn’t be a problem. The only catch, he jokes, is, “they have to be gold.” In that case, he thinks his dad would let him bring aboard a piece as large as the Town Dock. Where the white stones live. Marvin shows where part of his collection travels while New Life is under way – under the forward settee. Then there’s the matter of stowage. 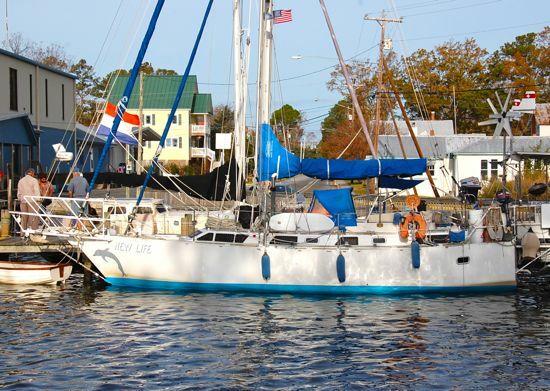 While long on adventure, sailboats can be short on space. Focusing his collection on certain pieces has kept the size manageable. 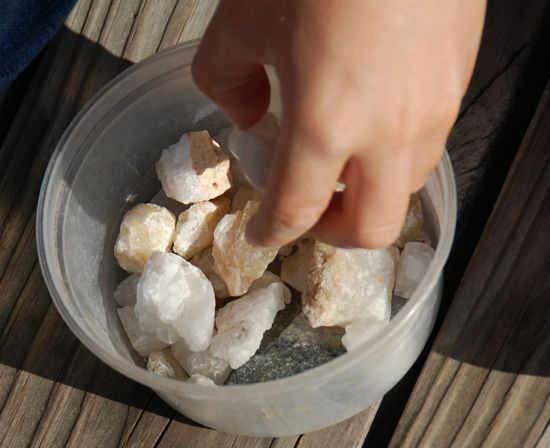 A small plastic storage container houses his collection of white stones and quartz. Other samples occupy a plastic baggie and a black metal box.